Touching photos accompany this story of Corky’s miraculous revival. Fort Worth Fire Battalion Chief Gary Lee checks Corky for signs of life. 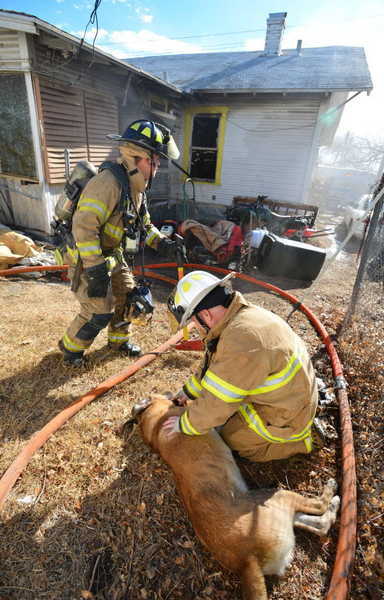 Crew members of the Fort Worth Fire Department worked diligently to resuscitate a dog pulled from a burning home that had been unconscious for about 30 minutes. A fire broke out at single-story Texas house on Thursday afternoon. Neighbors were calling 911, but a fire truck happened to be in the area at the time and were already on their way after spotting smoke. “The driver said he noticed a haze, and they drove right up to it,” said Engineer Tim Hardeman, fire department spokesman. Fourteen other crews also responded to battle the intense blaze that was spurred by strong winds and interior clutter. Flames were reaching the attic, but the firefighters were able to control the fire. A neighbor told them that an elderly man lived there with two dogs. The man was not inside at the time, but his dogs were. Firefighters quickly found them. 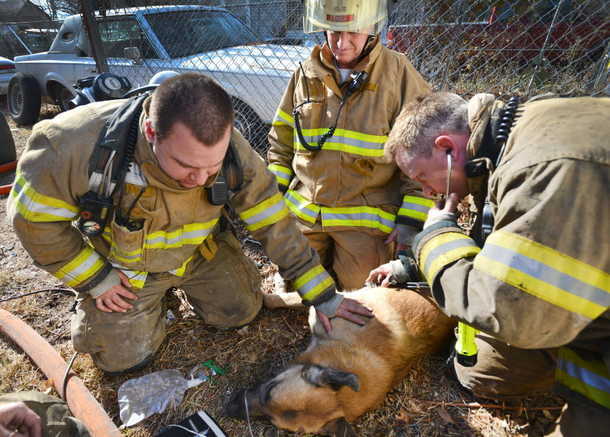 Firefighters hastily started work to revive Corky, who was perilously close to death. They used CPR and special oxygen masks for dogs. After half an hour, he finally came around. He was alive, but crew members urged the owner to take him to a veterinarian, as inhaling smoke can later cause fluid to develop in the lungs. 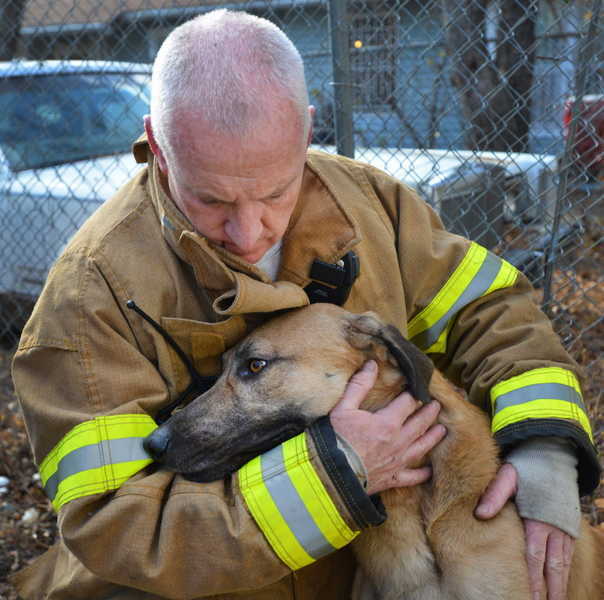 Firefighters understand how important furry family members are, and strive to do their best to save them as well as their owners. 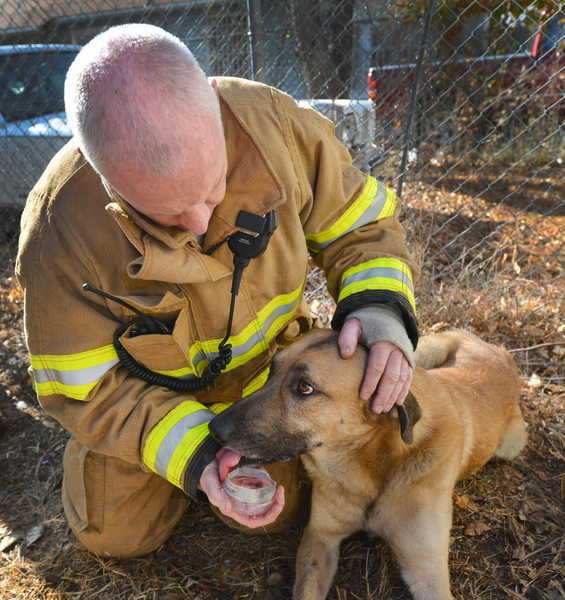 Thank you to all firefighters who take the extra time to save animal. We hear so much horror about what people do.let hear it for the goods guys! So good to see people going out of their way for an animal! A life is a life, no matter how furry. Glad these guys were there to help! A heart-warming story! And thanks too to whoever or whatever (Org.) donated those pet oxygen masks! To those who face personal dangers in their efforts to rescue, thank you. For those who take time to respect and commit to life of 4 leggeds too, many thanks. Great story of great people involved. The old man now has his 2 dogs. Makes me think about my house and safety of my critters here. Will ask our fire department if they have pet oxygen masks….